Baciro Djá was appointed Prime Minister of Guinea-Bissau by President José Mário Vaz. He succeeds Carlos Correia, whose government was dissolved on 12 May 2016. 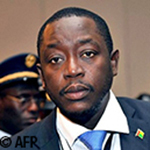 This is the second time this African Party for the Independence of Guinea-Bissau and Cape Verde (PAIGC) official, who is the party's third vice president, has been named to head the government under the mandate of President Vaz. He was previously appointed Prime Minister in August 2015 to replace Domingos Simões Pereira, PAIGC chief and great political rival of the president. The appointment of Baciro Djá was challenged by the party, which demanded the president reappoint Mr. Pereira. Djá was forced to resign a few days after being sworn in. Born in 1973, Baciro Djá holds a degree in social psychology from the University of Havana and a clinical psychopathology degree from the Higher Institute of Applied Psychology in Lisbon. He began his political career in 2006 as co-ordinator of the defence and security sector reform and director of the National Defence Institute. Elected as deputy for Naçao from 2008, he was appointed minister for youth and sports that year before taking on the post of defence minister between 2011 and 2012 under President Malam Bacai Sanhá. Baciro Djá was sworn in on 28 May, but his appointment was again denounced by the PAIGC, which disputes the legitimacy of his appointment.